Updates to Raye's profile since your last visit are highlighted in yellow. Married with two grand babies, Mia born 2006 and Dominic born in 2013. I never More…knew how good life can be. Went to Bay Area to go to college and met my husband. We married and had one son, Justin. We now have two grandchildren. We moved from the Bay Area to Rio Vista in 2003. We love living in a small town and near the water. Loving life. So many memories! Senior Follies with Becky Rounsaville, Trude Cook and Theda Foster. Cardboard waves and all! The pysch class with Jim Fowler, Rick Kilmer and so many others. Big Little Week was ALWAYS fun, do they even do that anymore? Raye Graham Hansen has a birthday today. Raye Graham Hansen added a comment on Catherine Ahmann Evans' Profile. Raye Graham Hansen added a comment on Profile. New comment added. 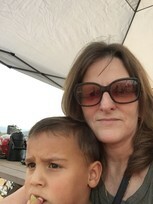 Raye Graham Hansen changed profile picture. Raye Graham Hansen added a photo to profile gallery. Raye Graham Hansen posted a message. New comment added. So sorry to here about you husband. I couldn't imagine going through that. I'm envious of your adventurous spirit. I don't what kind of riding wins you that buckle but I'm must be pretty cool. Raye Graham Hansen updated profile. View. Raye Graham Hansen joined via Class Connection Facebook app. Raye Graham Hansen added a photo to profile gallery. New comment added. Our son Justin, daughter in-law Blanca and grandbaby Mia.